Docking has a long and fascinating history. Evidence from either within the village or from the surrounding fields shows humans have been present here for many millennia. The earliest evidence may be from nomadic people who only set up temporary camps, but later evidence clearly shows a more permanent settlement. 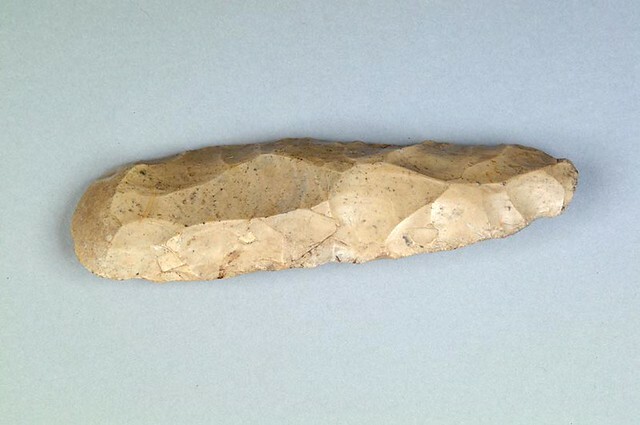 There is plenty of evidence of early occupation from the Palaeolithic (before 10,000 BC), Mesolithic (10,000 BC to 4000 BC) and Neolithic times (4000 BC to 2300 BC) in the form of scrapers, axes and arrowheads. From the Bronze age (2300 BC to 800 BC) there are signs of earthworks including barrows and axe heads, and from the Iron Age (800 BC to 43 AD) there have been finds of pottery. The distribution of these finds points to small populations of hunter gatherers. It’s in the Roman period (400 BC to 43 AD) when the finds evidence indicates a more permanent settlement of Docking. There have been plenty of finds from this time including pottery, coins and earthworks. Originally either DOCCE, ‘the place where docks grow’ – Old English docce (dock, waterlily), or DOCCINGAS, in Anglo-Saxon ‘the place of Docca’s people’, referring to a local Anglo-Saxon leader (Fring means ‘the place of Frear’s people). The oldest written record of the name seems to be in the will of Aelfric, Bishop of Elmham, d. 1038, who owned land here acquired during the reign of King Cnut, spelling it DOCCYNGE. In Domesday Book, 1086, it is spelled DOCHINGA, DOCHINGE, DOCKINGE and DOCKINHE. In 1334 it is DOKKYNG, and on Saxton’s map of 1574 it is DOCKINGE. By the time we get to Faden’s map of 1797 it has become DOCKING the spelling we use today. He also holds DOCKING where Aelfric held before 1066 under Stigand. Always 1 plough in lordship. 5 villagers; 5 smallholders. Then 2 slaves. Then 1 men’s plough; now 1½ ploughs. Always 1 cob; 1 cow;17 pigs;80 sheep;1 plough could be restored. Value 20s. The whole has 1 league in length and ½ in width, it pays tax of 5s 2½d, whoever holds there”. 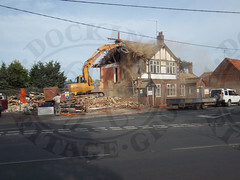 We have yet to discover any physical remains of the priory that was at Docking. It was an alien priory of the Benedictine monks of Ivry in the diocese of Evreux in Normandy, northern France. It was ranked as an alien grange or manor and active from 1209 till 1415 when it was dissolved and granted to Joan, Dowager Queen of England. The alien priories disappeared early; they were dependent on parent houses in France and unpopular. In 1414 an act was passed suppressing all alien priories and this included Docking. The priory was endowed with tithes from Heacham, Southmere (Summerfield) and Titchwell and the rectories of both Docking and Southmere. It had a gross income of £13 per year. The priory was endowed by Henry VI. In 1440 it was granted to Eton College, which he created and which owned land in Docking. 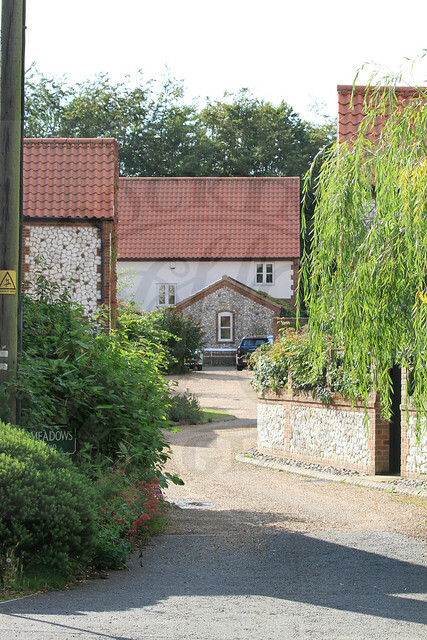 The location of the Priory is unknown although Richard Le Strange (Monasteries of Norfolk) says it was ‘connected’ to St Mary’s church though whether this means physically we don’t know. So far we have found a number documents relating to Docking priory but as yet they have given us no clue as to it’s actual position. Most simply lead to a dead end although we hope they may still give us some indication of the size of the community at the time. The oldest building in the village is the Grade II-listed Church of St Mary the Virgin. It’s built of flint, with freestone dressings. The oldest visible parts are in the chancel, which was built shortly before the Black Death in 1348. It’s possible St Mary’s could be built on the site of an earlier Saxon church as there are references to land being owned by Aelfric, Bishop of Elmham, in 1038. The 80-foot tower was built around the time of the Battle of Agincourt in 1415. The top of the tower is one of the highest points in Norfolk, and commands excellent views over the Wash and North Sea. It contains a peal of six bells, the oldest of which dates from 1622, and bears the inscription ‘John Draper made me’. The altar in the Lady Chapel is marble-topped and has the date 1638 carved on one end. The octagonal-shaped font also dates from the 15th century, and bears the figures of seated apostles and saints. It depicts St Andrew with his Saltire, St John holding a chalice on a closed book in his left hand, and a branch in his right, and, unusually, St Appolonia, the patron saint of dentists. She is shown holding forceps or pincers in her hand. The angles of the bowl have figures on them, as does the stem. On the base are four animals. The organ was built by G M Holdich and dates from about 1858. It’s believed to have stood in a west gallery, and had gilded pipes. It was extended by Lloyds of Nottingham in 1875, and further modified by Norman and Beard in 1914. The church was re-roofed and new pews installed in 1838. The north aisle, organ chamber and Lady Chapel were added in 1875, when the organ was moved to its present position. The clock on the tower was installed in 1902 to commemorate the coronation of Edward VII and Queen Alexandra. Electricity finally came to the church in 1937. 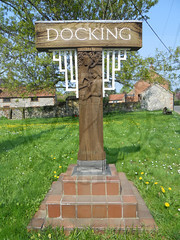 Docking, like many other villages, has its own war memorial dedicated to those who fell in the two World Wars. 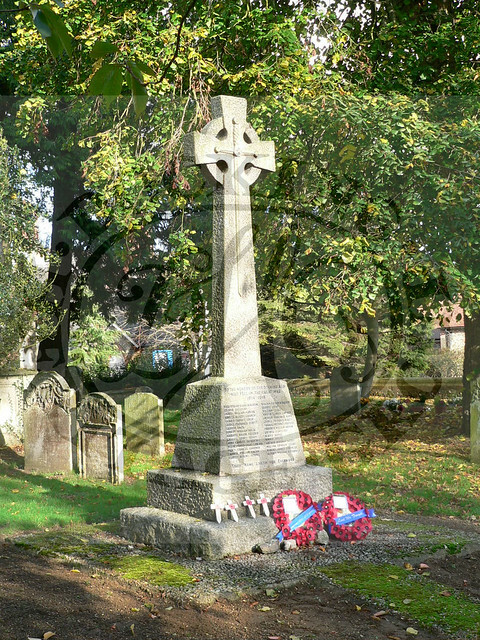 It is made of rough grey granite and consists of a cross surmounting a column on which the names of the fallen are inscribed. The whole memorial stands on two large granite slabs. It was erected in about 1920 at a cost of just under £190. Details of those listed on the memorial can be found at www.roll-of-honour.com/Norfolk/Docking. The heritage group has further details of many of the servicemen shown on it. 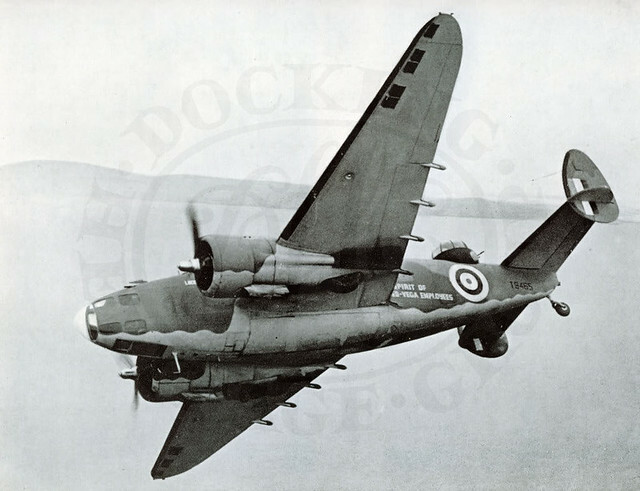 During World War Two Docking was home to a very active frontline airfield. Situated just to the north of the village it was one of 43 wartime airfields that could be found around Norfolk. Details about the airfield and how it effected the village during this period can be found on the “Wartime Docking” page. 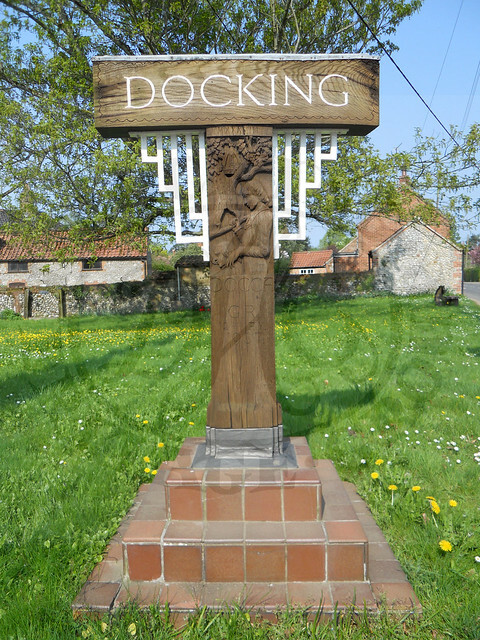 Docking was one of the first Norfolk villages to have a rail service. The station opened in 1866 as part of the West Norfolk Junction Railway, a branch line between Heacham and Wells-next-the-Sea on the north Norfolk coast. After one change of ownership, in 1890 the 18-mile line became part of the Great Eastern Railway. In 1923 it was absorbed into the London and North Eastern Railway (LNER) one of the Big Four railway companies created by the government when it amalgamated the country’s many privately owned networks. The three other big companies created under amalgamation were the Great Western Railway (GWR), London Midland and Scottish (LMS), and Southern Railway (SR). Finally the Heacham-Wells line came under British Rail Eastern region when the railways were nationalised in 1948. Docking was one of the largest stations on the route. 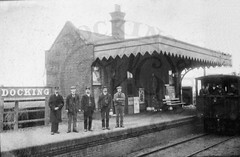 There were two passenger waiting rooms, for down (Eastbound, as seen in the picture) and up (Westbound) trains, a goods yard with a goods shed, livestock pens and a signal box. Livestock and crops such as corn and sugar beet were transported from Docking by rail, and agricultural equipment brought in. During the Second World War thousands of service personnel passed through the station on their way to and from the two RAF airfields nearby. The line also carried munitions to the airfields in wartime and fish from the port at Wells. The station served the people of Docking for well into the 20th century although usually only about four passenger trains and one goods train ran each way daily. The passenger service ended after the sea washed out the line between Holkham and Wells in the 1953 East Coast floods. A goods service continued to run as far as Burnham Market until 1964 when the line was finally closed. 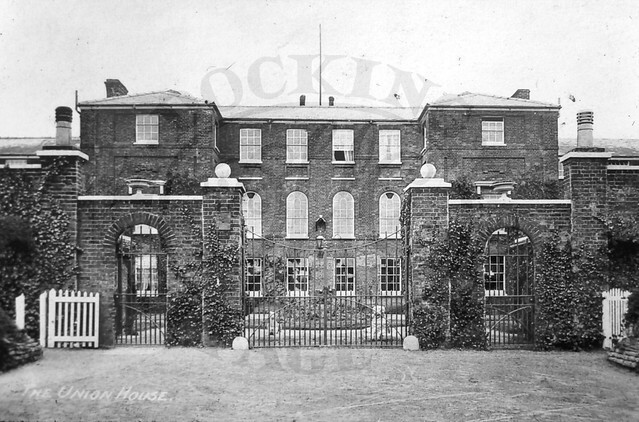 The station site at Docking was demolished except for the stationmaster’s house which is now a private home, with part of the two platforms retained in the garden. By the 19th century and well into the 20th Docking was a large, almost self-sufficient village with a great variety of trades and businesses. It was essentially an agricultural community with several different farms and their supporting trades. These included blacksmiths, carpenters, wheelwrights, saddle makers and harness makers. The corn grown on the farms at one time was milled by windmills in the village, of which there have been four on different sites. More details can be found by going to the “links” page and following the links to Norfolk Mills. 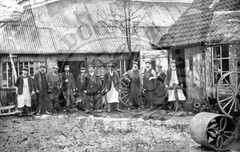 The residents needs were taken care of by a long list of other businesses which included butchers, general stores, a pharmacy, tailors, dressmakers and boot and shoe makers. 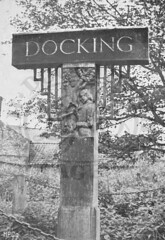 Docking has also had its fair share of drinking establishments, with around 11 public houses as well as numerous small beerhouses. Some of the pubs were even able to field their own cricket teams, as could many of the farms. In fact we can list well over 50 different trades and businesses that have existed in Docking. 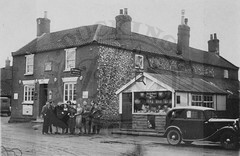 One of the best remembered, and largest, employers in the village was T R Wagg the baker. This business could trace its beginnings back some 250 years. In the church registers of 1752 a ROBERT WAGG is first mentioned. ROBERT married RACHEL WISEMAN and it’s from here that the Waggs of Docking are descended. 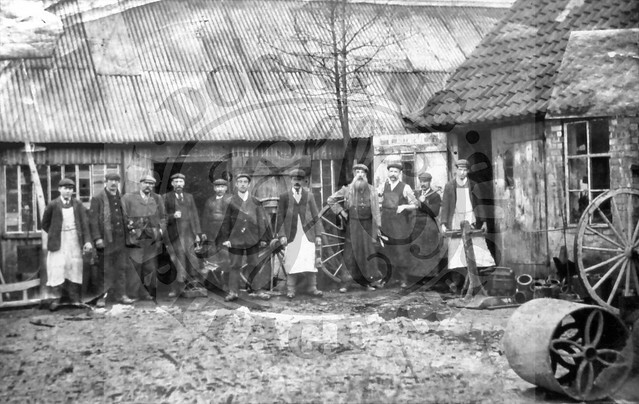 Their eldest son WILLIAM WAGG was born in 1801, and by 1839 is shown as a miller, owning the mill which once stood at the end of Mill Lane in Station Road. WILLIAM WAGG married OLIVIA STICER HOULT and had four sons and four daughters. WILLIAM died in 1848 and his widow OLIVIA with the help of her son, also WILLIAM, carried on the milling and bakery business. WILLIAM Jnr died aged just 20 and OLIVIA carried on the business with her second husband. On her death in 1867 the business was taken over by another of her sons, JOSEPH WAGG, who was already in business as a baker in his own right near Bell Pit. JOSEPH WAGG first married ELLA ROSE and had four children. All of the children, along with ELLA, died. JOSEPH then married HANNAH PORTER and together they carried on the business. JOSEPH died in 1890 and HANNAH continued the business alone, until her son ROWLAND WAGG was old enough to join her. When HANNAH died in 1915 ROWLAND took over the family business. ROWLAND WAGG married FLORENCE ANNIE and they had four children: TERENCE ROWLAND –WINIFRED – BRIAN and RICHARD. ROWLAND died in 1951. In 1930 TERENCE ROWLAND WAGG, or “TR” as he was known, began to revive the family business. TERENCE had married a Docking girl, DOROTHY BATCHELOR, and with her encouragement, and assistance from his brother BRIAN WAGG, they purchased a former butcher’s shop in Station Road. Before this, the shop had been occupied by the Bennett family, who were also bakers. The original ovens, which had not been used for 40 years, were still in place. When “TR” took over the business began to grow. Deliveries were made to the surrounding villages, firstly by handcart and later by a Model T Ford van. In 1952 “TR” purchased the piece of land that the modern bakery was built on. 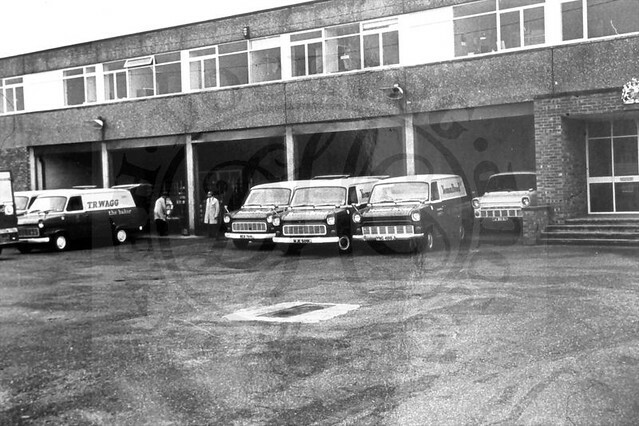 The business continued to expand, and the company’s large fleet of delivery vans became a familiar sight across East Anglia. 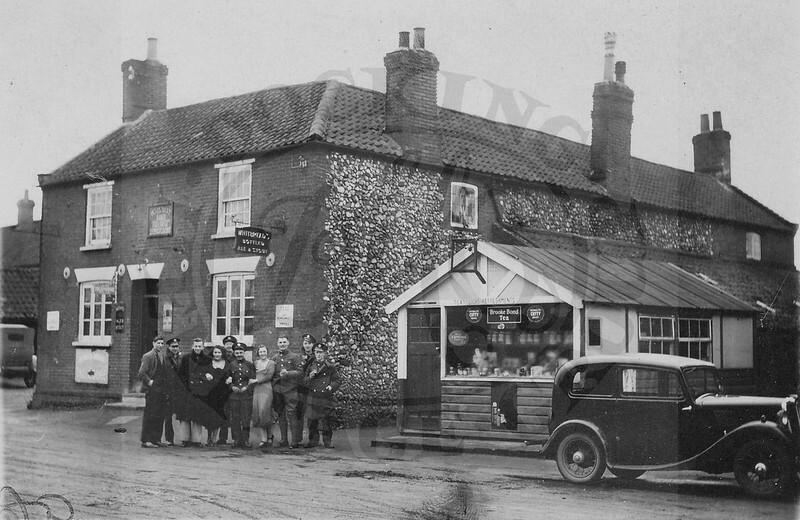 As well as having a shop in Docking, shops were also opened in Kings Lynn, Hunstanton, Fakenham and Downham Market. The company also ran a chain of coffee houses. The business eventually employed more then 100 people in the village and beyond. T R Wagg (The Baker) Ltd was awarded the Royal Warrant as suppliers of baked goods to the Queen at Sandringham. “TR” died in 1973 and it was only another two years before the business closed. The end of an era. Parts of the village hall in Docking, known today as the Dr W E Ripper Memorial Hall, date back almost 150 years. 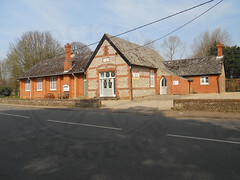 The flint annexe was built in 1869 and was originally a Working Man’s Institute where the men of the village would gather to read newspapers which were provided daily. 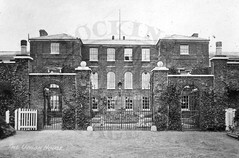 In the 1920s the main part of the hall and the small extension, made of red brick, was built by the Oddfellows. In later years part of the annexe and the small extension that now houses our heritage room was used as the doctor’s surgery and continued to be used as such until a new surgery was built nearby in 1982. In 1969 Mrs Nancy Ripper purchased the hall for the sum of £3000, dedicated it to her late husband Dr W E Ripper, and gave it to the village. You can find out more about Dr Ripper by going to the “People from the past” page. The village name sign was made to commemorate the Coronation of King George VI in 1936. Made of oak, the carving shows Docca, reputed Anglo-Saxon founder of the village, and his son. The bishop’s mitre in the oak tree represents Aelfric, the Anglo-Saxon Bishop of Elmham (d. 1038), who owned land here. The sign was erected on the 12th May 1937 with the official unveiling ceremony taking place on 30th October of the same year. Originally the sign was surrounded by a simple chain fence which can be seen in the picture on the right, the concrete and tile base was added later in around June 1939. 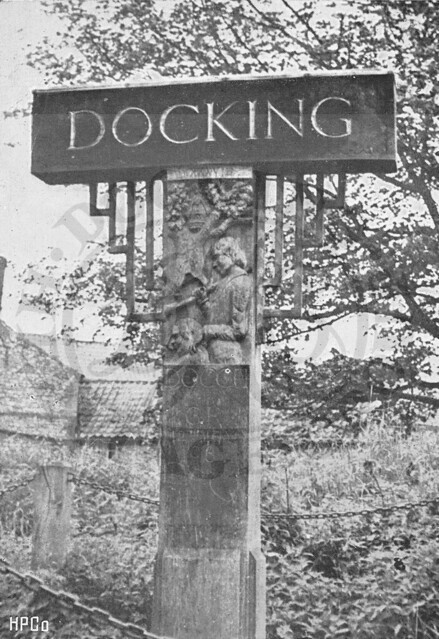 The Docking we know today has changed greatly from the Docking of yesteryear. Almost all of the trades and businesses have disappeared, leaving just a handful surviving. Of all the pubs and beerhouses only one remains open, the Railway Inn. 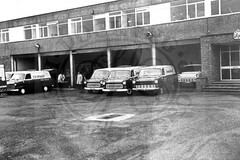 Many of the premises that were once home to these businesses have been turned into private homes, or demolished and replaced with modern housing. Many are now used as holiday homes. 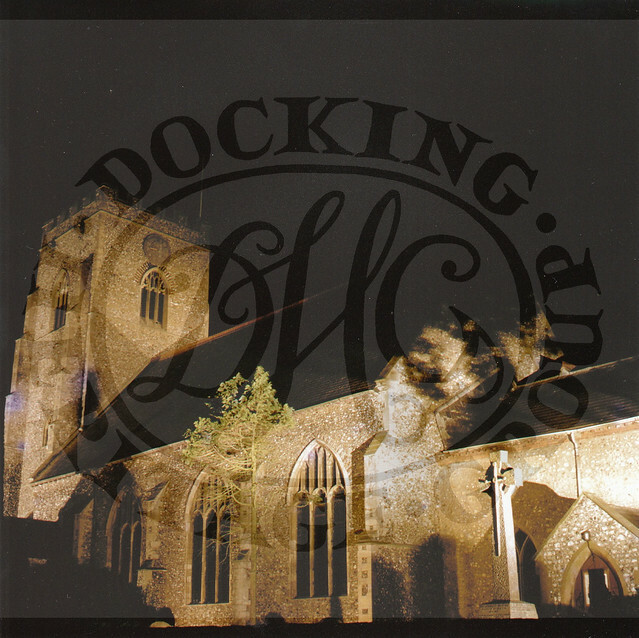 Docking has lost much of its history but there is still a lot left to be discovered and recorded and you can help us to do it. Do you live in an old building here that still shows signs of its former use? Do you have any old pictures, or documents that will help us to reveal a hidden past? Have you ever dug up anything mysterious in the garden? If you can help in any way please contact us.